Pour the vinegar into a small pan over medium heat, and simmer until the vinegar has thickened and reduced to 1½ tablespoons. Set aside to cool. Arrange the sliced mozzarella and peaches on a round board or plate. Drizzle with olive oil, and season with salt and pepper. 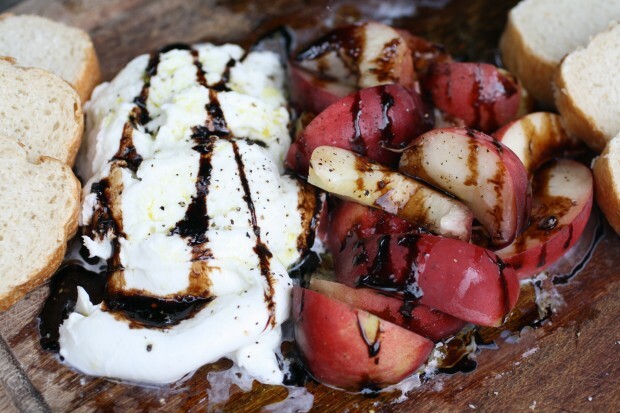 Once the balsamic reduction has cooled, it will be even thicker. Drizzle all over the peaches and cheese. Slice up some crusty bread, and tuck it around the edges of the platter. Enjoy. Absolutely delicious ~ cannot wait to try this recipe! !